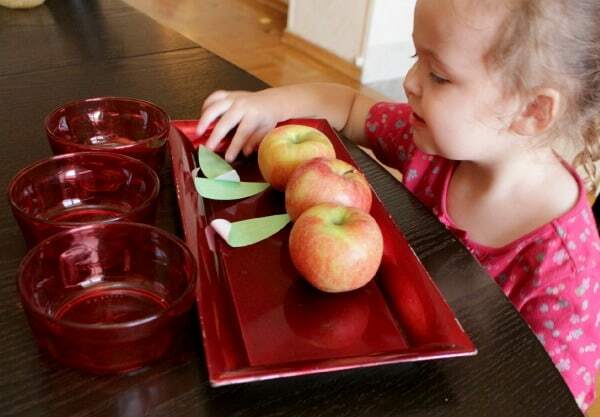 This counting apples activity was partly inspired for my love for apples, (as evident in all the apple activities that we’ve been doing for the last month!) and partly because it is the theme for a newly started #PlayfulPreschool series by me and several other awesome bloggers. Every Wednesday we’ll be bringing you a new theme filled with lots of different interactive ideas and inspiration to create a playful preschool time for you and your kids. In the #PlayfulPreschool series you will not find any worksheets. No letter tracing. No word copying. That’s because it is not developmentally appropriate to expect 3 and 4 year olds to do those things on a regular basis. 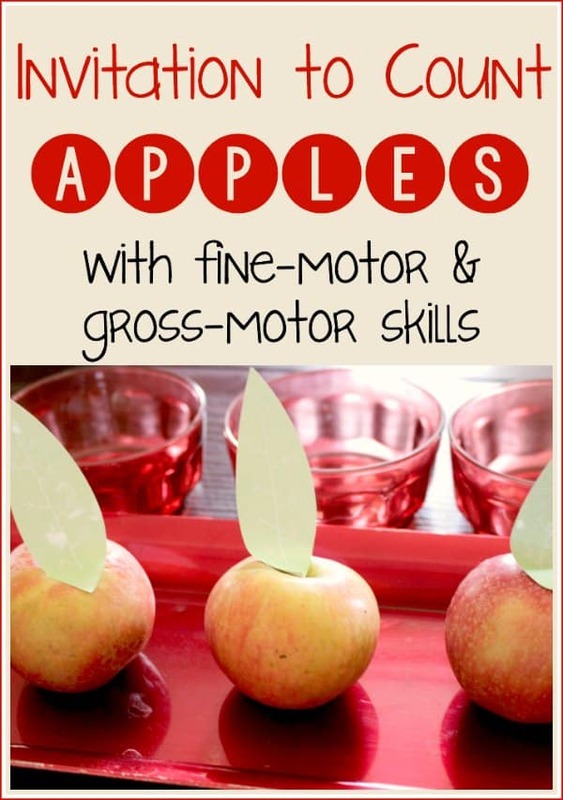 Instead of writing they should be developing their fine-motor skills with pre-writing activities. Likewise, you will not find advanced math skill covered or too-deep science and literacy topics. These activities are created by experienced homeschool and classroom teachers with their experience and the developmental levels of preschoolers in mind. For my part, I will be talking about how to work with special needs preschoolers. Of course, I can only go by my experience so, if your child has different needs, I encourage you to modify any and all activities to fit the developmental needs of your child. Likewise, all of the activities that I share can be differentiated (modified) to meet the needs of more advanced preschoolers. I’ll share some ideas on that, but please, if you modify my activities in any way, share how you did it in the comments, so that we can all benefit and make our preschool time even more awesome! For those that are new to visiting this blog, I want to share a little bit about my 3 year old, Shiloh. Shiloh has a severe language delay and delayed motor skills as well as hips that are incorrectly formed. We are in the process of starting doctor visits and tests that will give us a clearer picture of what exactly we are dealing with, but the working assessment is that she suffered a brain injury at birth due to lack of oxygen. Rather than get into all the technical things that would be implied, I’ll simply say that Shiloh has the language and motor skills abilities of an 18-20 month old. But she has three older sisters that she is desperate to keep up with! 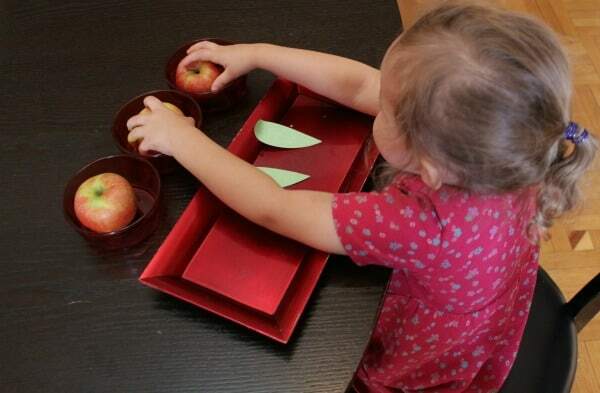 So when I put together this Invitation for Counting Apples, I adjusted it to a level that she could work with and not be too frustrated with the challenge. I knew going into the activity that success would not be counted as mastery of the skill of counting, but in effort to perform the task. It’s important to have the proper goals in mind when working with a child who has special needs. For Shiloh, the goal was to be exposed to counting (to 3) and to practice her fine-motor and gross-motor skills. Another reason it’s important to have goals is to help you avoid putting too many new skills into the activity. While working with apples, I could have chosen three differently-sized apples and worked on putting them in size order. Or two apples with matching colors and one of a different color and worked on matching. Or even three apples of different colors and worked on color words. Without changing any of the tools, I could have worked on positional words: on, in, out, on top, beside, etc. But that is too much for her to absorb at one time and would only lead to frustration and she would not have left the activity with a clear understanding of what she had done. You can adjust this to incorporate the numbers that you want to practice 3, 5 or 10 by including that number of apples, bowls and leaves. We started by counting the apples, pointing and counting out loud with each one. Because Shiloh doesn’t understand the concept of one-to-correspondence, I needed to hold her hand and place it on each apple several times before she was able to repeat the action herself. Again, I was not expecting her to grasp the mathematical concepts with this activity, though most preschoolers should be able to comprehend counting each object. 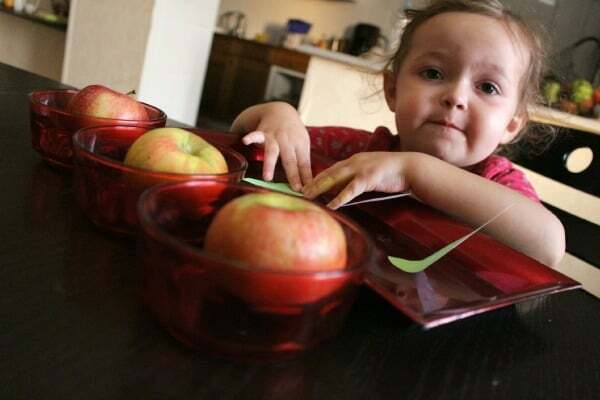 Then, I worked with her for a few minutes demonstrating how to place the apples in the bowls while we counted out loud. Followed by taking them out of the bowls and placing them back on the tray. I tried to show her how to place the leaves on top of the apples, but she was very disturbed with that action at the beginning of the activity. Since preschool definitely should not be a time of stress for a child, I quickly abandoned that part of the activity and she was content to ‘count’ the leaves while they were on the tray. 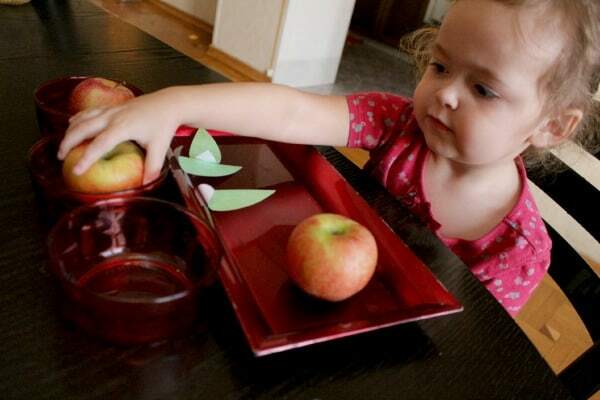 Picking up the leaves and sticking them back onto the tray was great fine-motor skills practice while moving the apples to and from the bowls and tray gave a bit of gross-motor practice with her arms. Normally, I would do an activity with her at her tot table, but it was occupied with moving boxes. I was not happy with how much she needed to stretch to be able to properly view and work with the items on the kitchen table. While we were at it, Shiloh decided it would be very fun to sniff the apples. Since sniffing and blowing with her nose is a skill she needs work on, I was happy to incorporate it into our counting activity. Once I had demonstrated for a few minutes, she wanted to try on her own. She even decided that once the apples were in the bowls, she should move the bowls onto the tray, so we counted as she moved the bowls. And, after she was more comfortable with the activity, she decided that the leaves could go on the apples as well. It was a good thing that I left that skill up to her! This was her ‘I’m done!’ face and she left the activity happy. How can I measure the success of the activity? Remember I told you that my goals were to practice fine-motor and gross-motor skills and also to expose her to counting? I was able to easily observe the fine-motor skills and gross-motor skills practice as she played with the apples, but I couldn’t really gauge how well she absorbed the counting aspect for the long-term at that moment. However, I had her show Daddy when he came home and she happily climbed up to the table and started counting ‘ree’, ‘one’, ‘tew’. All in random orders, but at least she remembered the numbers we were working on. She did throw in a few ‘bives’ (fives) just for good measure because it’s one of her favorite numbers to say. And today when we went to the grocery store and she wanted my husband and I to swing her between us she kept repeating, “ree, tew, bive”. Just remember, when you are working with a child, you may not see mastery of a skill or immediate understanding, but by exposing them to the skill they are one step closer to mastery than they were before. Those are the cutest sticky notes ever! 3 is a GREAT number to start with. Often I think that we see the number 10 for activities, but the reality is that 3, then 5, then 8, and then maybe 10 is a good way to introduce the numbers and 1:1 correspondence for our preschoolers. This is such a concrete activity for our preschoolers. Thank you for sharing. I may have to just cut my own leaved and put tape on them so we can do this today! Amanda, I saw the leaves and just *had* to have them! I also found some adorable speech bubbles that I need to find a use for very soon. I wish they had that store all over! I love using real life objects for counting. Thanks for sharing! It seems like she grasped the concept of counting. You should be very proud cause it’s stuck in her head. I can also tell that she enjoyed it and was happy to share. Five is a very popular number amongst kids I see. I guess its the way it sounds. Thanks for sharing the way you needed to break up the activity to make it more concrete for her. Will be fun to start to introduce numbers to the game or a larger tray and she grows in skills. So glad to have you joining the Playful Preschool group! Yes, I’m very excited to share about her progress! 6 months ago she wasn’t even talking, so I thrilled with how she is doing! I’m very glad to be a part of #PlayfulPreschool! My son loves an activity that allows him to play with food, so I know he would enjoy this! I love that it is simple and easy to set up and accomplish. I love how you followed her lead, kept it simple and encouraged exploration! Love this invitation to play and count with apple! Nice post! This is such an important concept – counting and one-to-one correspondence. I love how you made sure the activity started at her level, with parts that she needed a little direction with. You also gave her independent choices and let her explore — love that! Her favorite words of the week are quickly becoming, “free, tew…” So I’m glad it’s had some lasting impact for her since we’ve struggled with her retaining new knowledge. 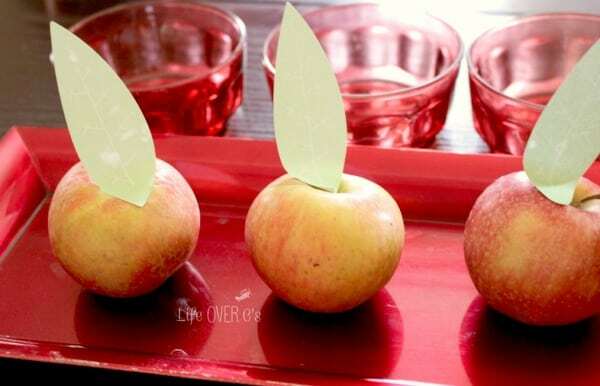 What a great activity for little ones…and like someone else mentioned, ours would be eaten with every count. 🙂 My 20 month old “helped” me put apples away the other day, and when I pulled one out later, I noticed that every single one had teeth marks in it. lol! That’s hilarious about the teeth marks! Yay Shiloh! Don’t worry Kim, I over use the word ‘awesome’ all the time. Sure there are other words in my vocabulary, but I choose to use that word. Does Shiloh have hip displatia? J had that when she was born too! Just happy she had fun and her ‘I am done’ face is precious. Oh, I look forward to reading your posts each week! You include so much pertinent information! An early childhood gold mine!